SKU: UNS/UNF1. Category: Flame Proofing Material. 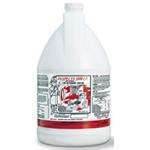 Un-Flame is a clear, water-based liquid that renders suitable materials flame proof. Un-Flame reduces oxidation and produces a thin layer of char which stops further combustion and extinguishes the fire. Interior fabrics (carpet, drapes, furniture) are the number one factor that contributes to the swift spread of smoke and fire inside home. 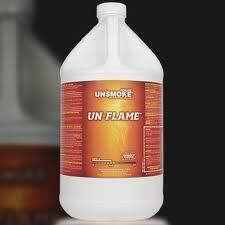 Unsmoke Un-Flame is a clear and odorless product that was designed to help alleviate this source. Un-Flame is a clear, odorless water-based, non-toxic, clear liquid that is applied directly to furniture fabrics and other interior fabrics/furnishings. It can be applied with a pressure sprayer, cold fogger, or airless paint sprayer. Unflame inhibits oxidation and produces a thin layour or char which stops the flame and further combustion and actually extinguishes the fire. Un-Flame can be applied to upholstery, bedding, mattresses, drapes, curtains, tablecloths, or just about any fabric item. Un-Flame will also withstand dry-cleaning, but will need to be reapplied if the item is wet-cleaned. Un-Flame meets NFPA-701, Steiner A.S.T.M.-E84-80 Tunnel Test and the F.A.A. Horizontal and Vertical Tests.